Mit diesem eleganten und glänzenden Notebook mit neuem HP Imprint-Finish machen Sie bei sich zu Hause und auf Reisen eine gute Figur. Die umfassende Leistungsstärke eines Desktop-PCs mit der Handlichkeit eines Notebook-PCs zu einem überzeugenden Preis. It was a hot summer’s day, so I waltzed into Best Buy to check out the latest gadgets and to cool off. The first thing I saw was the glimmer from HP’s shiny new notebook, the dv6000z. The design was what caught my eye, a perfect balance of art and performance. The dv6000t is a great customizable notebook for all kinds of people. Whether you need just a basic laptop to surf the web and write documents, a medium range gaming machine, or something to just crunch lots of data this notebook can do it all when configured appropriately. It’s hard to find things wrong with such a beautiful and well built laptop, I can’t stop admiring its zen-type design even while I type this. Overall I think this is very balanced and priced very well comonentwise. I would definitely recommend it to anyone who needs a powerful machine, while still retaining stylish and futuristic looks. The HP Pavilion dv6000t is a full-featured multimedia notebook with a highly appealing look. Like all notebook computers, it is an exercise in compromise. What sets it apart from other machines, however, and goes a long way to explaining its popularity, is its impressive blend of looks, performance, comfort and price. At current prices, the dv6000t offers a fine mix of components and performance in the $800 to $1200 range. On top of that, it looks good and provides an exceedingly comfortable computing experience. I know that I, for one, would not have used it nearly as much as I did if it hadn’t given me excellent performance and first-rate comfort during our two weeks together. As I said at the outset, I really did look for something wrong with the dv6000t, but in the end I came up with only three “cons.” Of these, one, the screen resolution, is really a matter of personal preference and won’t make any difference unless a high-resolution LCD is desired; another, the issue of fingerprints, is rather trivial and may actually inspire the owner to keep the notebook nice and clean; and the third problem may be the rather short battery life. I have some mixed emotions about the dv6000t. It looks cool, retails at a low starting price, and boasts an impressive screen. The low battery life causes it to lose a few points, as well as the clunky, somewhat irritating touchpad. I don’t know why I was so bothered by the lack of the latching mechanism for the lid, but it detracted from my overall impression of the build quality. Hardware-wise, I was pretty satisfied with the dv6000t. The Core 2 Duo T7200 (2.00GHz, 667MHz FSB, 4MB L2 Cache), 1GB of DDR2-667 RAM and 120GB SATA hard drive were nice inclusions. I was happy with the TV tuner and its performance with Windows XP Media Center Edition and the remote control worked well. 75% The Pavilion dv6000t is one of the best entertainment notebooks around. A month ago, the HP Pavilion dv6000 series made a soft entrance into the dual-core laptop market by going with AMD's dual-core processor, but that left people wondering where the Intel versions were. At $1,660 (direct), I think the HP Pavilion dv6000t (Core 2 Duo) is priced fairly, though this particular configuration will not ship until the beginning of October. You will, however, be able to get your hands on a version of the dv6000t with the lower-clocked 2-GHz Intel Core 2 Duo T7200 processor starting in September. Overall, the dv6000t is an impressive media machine—as long as you stay close to an outlet. 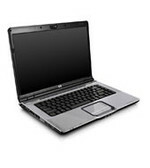 90% With the Intel Core 2 Duo inside, the HP dv6000t gets a performance boost. We’re happy to see that while there’s a new chip on the inside, HP didn’t alter the design of the slick Pavilion dv6000t. The glossy piano-black finish and gray pinstriping outside (with that color scheme reversed inside) looks stunning. Even better, the dv6000 t has the features and performance to complement its good looks. This six-pound notebook features a 15.4-inch widescreen LCD with a comfortable 1280 x 800-pixel native resolution. DVDs looked great on this display, and we love HP’s QuickPlay feature for launching and controlling multimedia files without booting up Windows. Viewing-angle performance was typical for this class of panel: good from side to side, but images looked washed-out when viewed from above.